His Holiness the Sixteenth Gyalwa Karmapa, Rigpe Dorje, through his sheer presence, was living proof that the Buddhadharma works. 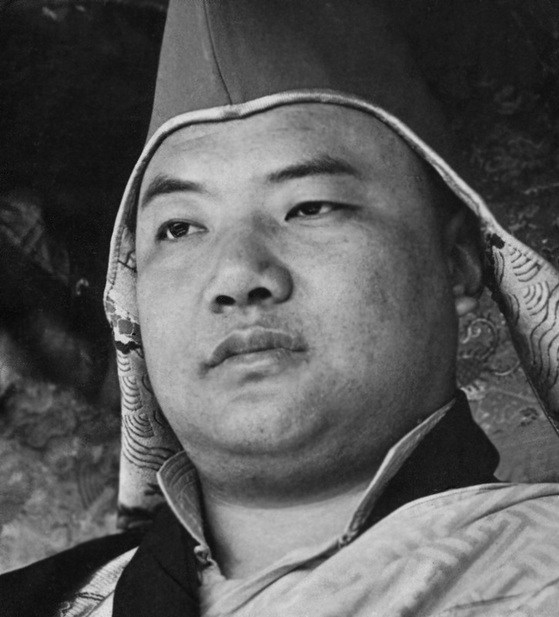 Tibetan intellectuals can be very critical, and some criticized the Sixteenth Karmapa for not being highly literate and well-versed in philosophical discourse and liturgical details. People can say what they wish, but no one can deny that when the 16th Karmapa appeared on the throne, he instantly transformed the environment and the people within. I have been extremely fortunate to receive many teachings from the Sixteenth Karmapa, and even as a young boy to follow him when he circumambulated the Great Stupa at Boudhanath at 2:30 in the morning. He often circumambulated at that time because he was so busy during the day. But only now am I beginning to appreciate that the Buddhist teachings need not be verbal or philosophical. In those early days I was too young to grasp that fully. Now I see that the simple presence of the 16th Karmapa, the Buddhas and the great masters, is enough to transmit the essence of the Buddhadharma. Many others who saw the 16th Karmapa share this view, including in the west, where in those days the Dharma was just beginning to be heard. Even the most intellectually stubborn academics and egomaniacs from different universities, without receiving any teachings, would feel something inside them change and open up when they saw His Holiness the Karmapa. Khenpos, intellectuals, scholars, and people like me try to teach so much over so many years. Maybe all our logic and explanation will convince one person the very morning of a teaching, but even then whatever you learn is gone the moment you leave the classroom. Nothing remains. But if you walk into the presence of someone like H.H. Karmapa, he does something to you that will remain with you much longer than all our ‘verbal diarrhea’. It is really the presence and being of the Buddhas and bodhisattvas that matters most. Because of who they are and how they exist they actually needn’t do much. Their mode of manifestation is living proof of the Dharma. This is particularly important at times like these when wrong views are so prevalent. Wrong views are very difficult, if not impossible, to defeat by logic alone. On the contrary, the better your logic, the more likely that you end up with a wrong view, something you become even sharper at promoting. The physical presence of someone like H.H. the 16th Gyalwa Karmapa is actually the best evidence of the right view, and gives us the greatest inspiration. Therefore, I’m very happy about this new book describing His Holiness’ life. Head of one of the largest schools of Tibetan – or in modern terms Himalayan – Buddhism, the 16th Gyalwa Karmapa was completely free, approaching everybody and everything completely impartially. His actions were quite naturally steeped in deep compassion. For him enlightenment was not a theory; he manifested wisdom and compassion spontaneously in every single moment of his life. At the same time, he seemed to overcome all cultural barriers naturally and without any effort. Despite his upbringing in the completely traditional culture of a Tibet that was in many ways still medieval, during his travels he inspired people who had grown up in a totally different world. Whoever they were, be they hippies, senior politicians – such as a former Prime Minister of France – or others who had found their way to him ‘only by chance,’ they changed in the presence of the 16th Karmapa: People opened up and were spontaneously ‘infected’ by his boundless joy. Quite naturally he brought them into contact with their positive potential, and motivated them to act in a wholesome manner, both in terms of spirituality as well as in their dedication to helping others. He brought not the slightest moral pressure to bear on others – no feelings of guilt – and did not expect people to blindly adopt any Buddhist dogmas. Karmapa touched people of all religions and spiritual traditions who were interested in spiritual transformation, even those who emphatically refused everything religious. Individuals lucky enough to meet or to see him – even in the presence of thousands of spectators – felt spontaneously accepted, their neuroses as well as their good qualities.